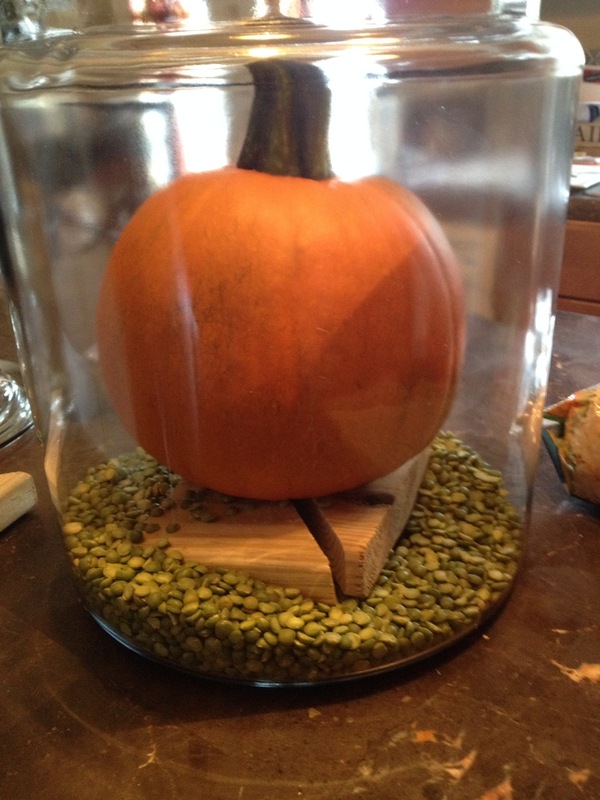 So I found this awesome centerpiece on Pinterest that was perfect for my kitchen table. I modified it slightly but it came out basically the same. Here are my supplies. This jar is from Walmart it was only $10 and I know I can use if for so many other things. I am looking forward to filling it with Christmas ball ornaments. Anyways I purchased two bags each of split peas and popcorn kernels. The pieces of wood are actually leftovers from our deck and I am using those instead of the suggested cans. I added the boards at the bottom and placed the pumpkin on top. 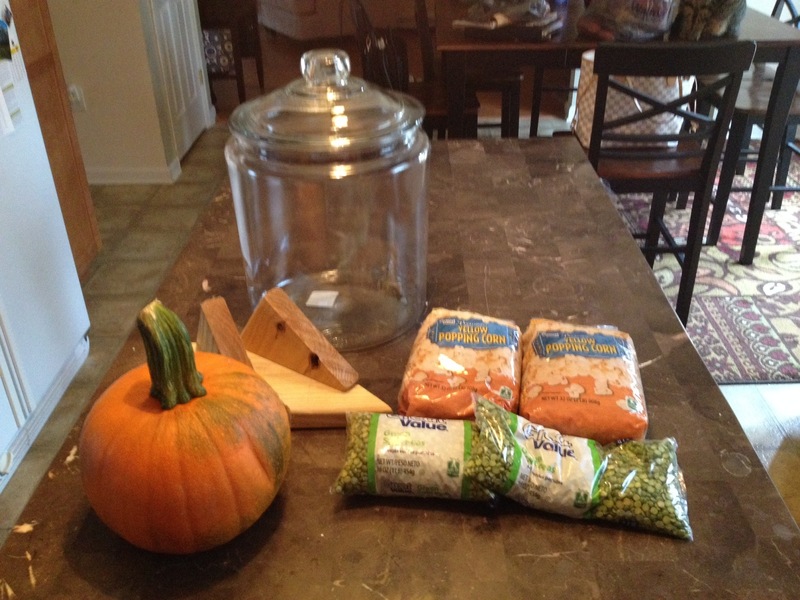 Note that this jar is NOT flat on the bottom so I had to make sure I got the peas to fill up the spaces under the wood. Otherwise it would rock back and forth. Now you can see the popcorn has been added. I used all of the peas but only about 1.5 bags of the popcorn. Here is my finished product with a bow. I had some leftover fabric from a wreath project last year that worked perfectly. So it looked great for a few days and then one morning I noticed that there was some condensation on the inside of the jar. When I removed the lid I realized the stem was molding. Apparently there wasn’t enough air flow. Here we have the Pinterest fail. So I have removed the lid and it seems to be do OK. 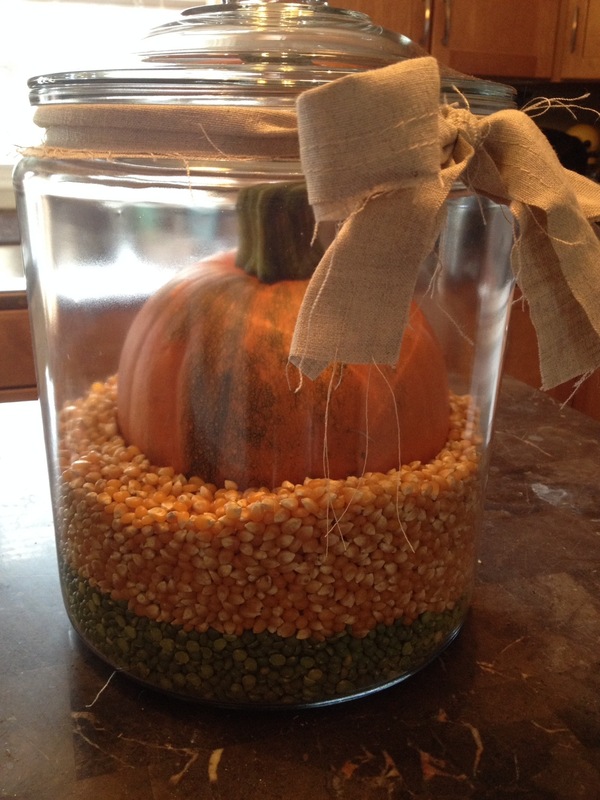 I was disappointed because the lid made it look super cute but no one wants a moldy pumpkin in a jar. Unless its Halloween and you are certainly going for creepy. 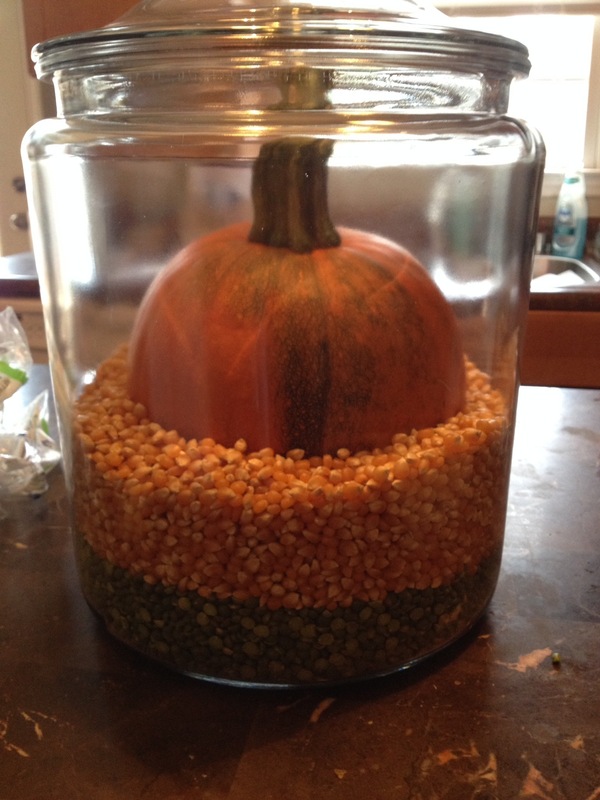 Any great fall crafts you have done lately?